APTRANSCO is www.aptransco.gov.in and http://aptransco.cgg.gov.in/. The online application forms will start from 26-03-2019 onwards. The closing date to submit the filled online application form along with the necessary documentation is on or before 25-04-2019 (will be updated soon). 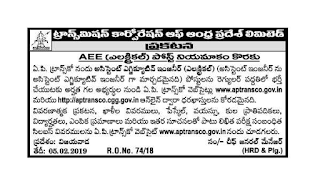 Candidates will be recruited based on the written examination and interview for the APTRANSCO AEE Posts Recruitment 2019. For more information about salary, age limit, application fee and how to apply are given below for the APTRANSCO AEE Posts Recruitment 2019. Region wise vacancies are updated below. The age limit for the candidates apply for the APTRANSCO AEE Posts recruitment 2019 is in between 18 to 42 years. The required qualification to apply for the APTRANSCO AEE Posts Recruitment 2019 is candidates should have done B.E/ B.Tech Graduation in Electrical Engineering. Selected candidates will get the pay scale as per the Govt Norms. 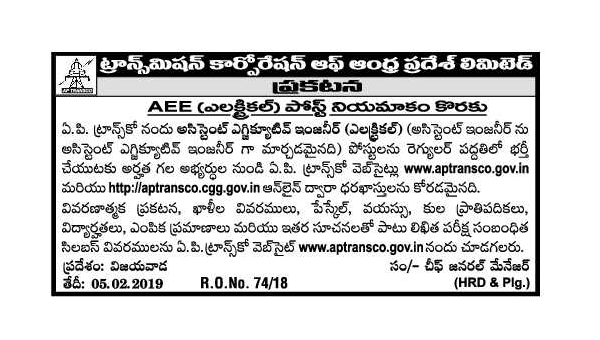 Candidates will be recruited based on the written examination and interview for the APTRANSCO AEE Posts Recruitment 2019. Interested and eligible candidates can apply for the AEE Posts through online official website of APTRANSCO is www.aptransco.gov.in and http://aptransco.cgg.gov.in/. The online application forms will start from 26-03-2019 onwards. The closing date to submit the filled online application form along with the necessary documentation is on or before 25-04-2019 (will be updated soon).